This week, students across Indiana began a shared “spring break” of sorts: the four-week period in between the first and second portions of the standardized ISTEP+ test. But there’s no time off for state education leaders, who continue to debate and discuss the future of that assessment and others. It’s a budget year in the current session of the Indiana General Assembly, which means paying for the tests is a big focus for legislators. And – as has become customary – members of Indiana’s State Board of Education and Department of Education officials each have their own ideas to bring to the table. Let’s take a look at the projected numbers, how state administrators calculated them in the first place, and how the process moves forward from here. How does the state go about deciding what it needs and can afford in terms of testing? Federal requirements mandate that schools administer an assessment that tests state standards. Since Indiana created its own set of standards after dropping the Common Core in 2013, they look to work with a vendor to craft that test. Like we explained last week, the IDOE works alongside the Department of Administration to define specifications – including a cost estimate – and seek out the bidder who best fits their criteria in a process called an “RFP,” or request for proposal. This go-around, the state put out calls for vendors for 14 different parts of the state’s assessment system – a slate of tests including ISTEP+ as well as tests like IREAD-3 and End of Course Assessments. 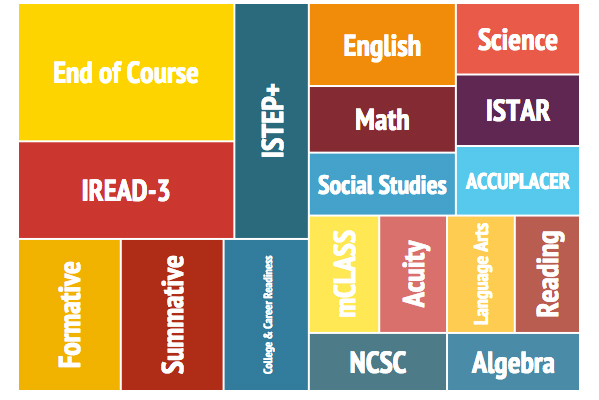 Eleven of those tests are currently part of the state’s program. Why so many exams? Some are “summative” – to test how much a student learned over the course of a year – and others are “formative,” which give a snapshot of what students know at a certain point in time. A test that captures how much a student learned over the course of one school year. The focus is on evaluating learning outcomes, often for accountability purposes (i.e. ISTEP+). A test that provides a snapshot of what a student knows at a particular point in time. The focus is on giving performance feedback, so teachers can modify learning activities to better student achievement (i.e. grades 3-8 Acuity tests). The state recommended some companies receive multiple contracts – for example, they suggest British testing company Pearson to work on the ISTEP+ as well as the IREAD-3. 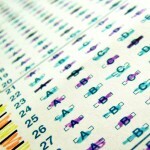 How much does the state anticipate spending on those tests? The DOA’s proposed price tag for a system incorporating all 14 recommended components comes in at just under $134 million over the biennium. For comparison, the sum of all current contracts adds up to about $96 million for two years. But, if the leaders at the IDOE and on the State Board have anything to say about it, the state will be spending much less. Like many parents and teachers, members of each of those groups argue that there is too much testing going on in Indiana – especially following all the ISTEP+ drama that happened this winter – so they’re looking to cut back on the cost and length of the system. So, following a bit of sticker shock after the state’s cost estimate came out, members of both groups released their own proposals to cut costs. The board’s proposal came in the form of a resolution written by board member Sarah O’Brien. Of the 14 tests the state hired vendors for, she proposes funding only nine of them ­– leaving out formative assessments in science and social studies, and only giving those tests in grades 3 through 8 and grade 10 – leaving out grade 9, which is what the state does now. The total cost of O’Brien’s proposal would come in at around $86 million dollars. Just a few days later the Department of Education released its own list of suggestions, when State Superintendent Glenda Ritz presented an updated budget request to a Senate committee. Ritz told the committee she had only heard about the board resolution through a press release. 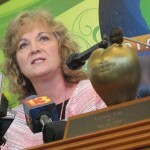 Ritz says her plan would cost just about $75 million– about $12 million less than O’Brien’s. The cost savings come in because Ritz told the committee that she supports funding only five of the 14 tests. The superintendent says she agrees with the board about keeping formative assessments only in English and math, but says she wants to see them in grades 3 through 10. She says she doesn’t want to leave out ninth graders because the way the state’s new A-F accountability system is written, it relies heavily on growth, which can only be calculated if it has consistent student data. Ritz also wants to completely eliminate IREAD-3 (which the State Board proposes keeping) and instead work to get reading data out of the ISTEP+. Sarah O’Brien plans to present her proposal to the full state board at its meeting April 1. The budget bill – including the IDOE’s entire proposal – is still working its way through the Senate. The total approved through that process will shape how the department determines what they can afford.